Who Mows The Lawn At Your House? There are jobs that we don't mind and jobs that we do. 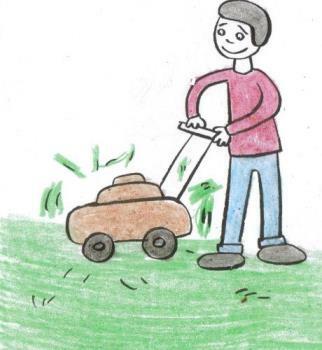 Most people do not like to mow the lawn, so they hire a gardener, give a kid in the neighborhood a way to make extra money or they make their own kid do it. I think I might love mowing a lawn, as much as I like to vacuum. However, I have never gotten the opportunity. Who does your lawn? We have a building Manager and they contract it out to some company who takes care of our grounds and plants/trees. They do a good job too but I wished they did not start so early in the mornings - they always wake me up! In Samoa we had no grass, lots of bushes/trees and a stone/coral driveway, with tons of dried up leaves that would fall everyday. Now sweeping that everyday was a chore and not enjoyable at all LOL It was nice to have three brothers who attended to everything outdoors when we grew up. The inside was left for us girls. Yes, brothers are very handy in that way because they are stronger and more rugged the we are. I wish that I had had a brother growing up, it would have been nice. It was nice to have two older brothers and one younger. They were very protective of my twin and I and I liked that! I love vacuuming, but hate mowing the lawn. My husband thankfully mows the lawn and weed eats, but I usually go rake up the grass afterward. Must be nice to have a husband who does all the grunt work for you. My husband mows the lawn. I have never mowed a lawn in my life. Growing up, I had four older brothers and either they or my dad would mow. I have a bad back and really can't mow because of it. I'm really OK with that. He does all the yard work and I do most of the house work. It works for us. We mow the lawn together..He does some then I take over..we just did ours today..I can't afford a lawn guy, but we enjoy mowing, it is good exercise and it gets us outside...Our yard is big but not so big that we need a riding lawn mower..
That is exactly what I was thinking, it does sound like good exercise. It also seems like it would be a lot of fun to do as a team, teamwork is cool. Our lawn is mowed by the janitor. We live in an apartment building, and we have hired a man to do all the boring outdoors jobs. I think he is very nice and good at his job, but I think he has a weird love for mowers and tractors. Seems he can never get enough of driving thoise machines around. It bugs me as he makes a lot of noice. I wonder why on earth it is not possible to make these things a bit more quiet. It would be a good idea if they were quieter. It is amazing that no matter how weird the job may seem, there will always be someone who has a passion for it. Maybe his father did the same thing. It is quite easy if you have a good mower,i do our lawns no problem. I am so glad that you mentioned this. I recently put all of my friends on notify and I hardly ever get any discussions from a lot of them. I was thinking about starting a topic about it, but I felt like I was alone in this. I guess I will have to continue to go and visit each ones page. I know that what you are saying is not an excuse. I have the same problem. So many times I have gotten completely over-whelmed from the noises around me and I have had to hurry to a place where there is quietness. I don't like a lawn mower or vacuum cleaner when it is too close. And that is just two of a very long list of things that I can not stand to hear. Please, if you are going to dream, dream big. Plan on having a husband to do that for you, I am. I plan to have my own house and I don't plan on mowing the lawn either. Ha, ha, ha, sounds like he needs some classes in neatness. That is good that you feel comfortable with getting after him to do things the right way, LOL. I usually do or my husband. It is so humid here now and I suffer from allergies so its not too enjoyable for me. I use a push mower too. We don't have lawn now so I don't have to worry about it, but when we buy house of our own on a nearby province I'll be glad to do it sometimes and of course with the help of my husband. Yep I do, I mow the lawn at our house. Sometime my wife would step in then I would let her mow and I then use the weed eatater and trim around the edges.